According to the U.S. Department of Education’s data, only 59% of the students that entered college in 2006 had graduated by 2012. When you look at the stats for students who graduate within four years, the numbers are even worse. So, why do so many students fail to graduate on time? There are a myriad of reasons, but your main concern right now is that you’re not one of those students. If you want to graduate on time, one of the most important factors to consider is proper planning. In this video, I’ll show you how I created a detailed graduation plan as a student, and how it helped me make sure I met all my requirements in order to graduate within four years. Want to use my graduation planning spreadsheet as a template for your own? No worries – I’ve included it as an new additional bonus for College Info Geek subscribers. 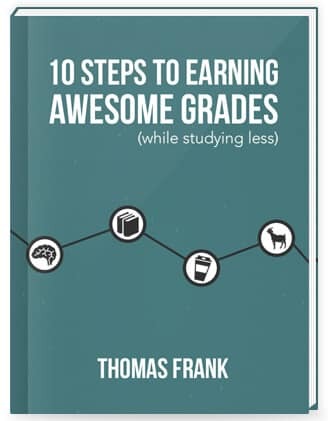 You’ll also get a free 100+ page book called 10 Steps to Earning Awesome Grades (While Studying Less), which I recently finished writing. People are enjoying it, and I think you will too. How do you make sure your graduation plan is running smoothly? Is there anything else you’d add to the tips in the video?